Jeanette Crawley sent me her transcript of ten pages of a memoir written in 1935 by her great-grandfather William Henry Knapp (1872-1952), describing his early life working in the City of London for a Provisions Merchant at the end of the nineteenth century, of which it is my pleasure to publish these extracts for the first time today. You might assume that the work of a City delivery boy was mundane, yet William delivered breakfasts to condemned prisoners at Newgate, tangled with Secret Service agents and attended executions. ‘Every day was of interest,’ he concluded retrospectively. I first saw the light on the 27th July 1872 at 73 Carter Lane, London EC2, formerly Shoemakers Row. My father was employed at the above address for forty-five years in the manufacture of tobacco etc and was resident for thirty-two years past, at the place where I grew and noted the ever-changing aspect of the City proper. At that time, cabs plied for hire and buses made their regular call at such places as the Mansion House and other notable buildings. I also well remember the extra horse ridden by a boy to help pull the bus up Ludgate Hill – what a contrast to the present day. I attended the local infant school and rose by gradual stages until it was time for lessons on a higher plane and I graduated to St Thomas Charterhouse, a school of sound teaching and hard and fast rules. I see today in my mind’s eye – fifty-four years after – the urbane and full-bearded headmaster, Mr Smith, who in turn was well supported by most efficient class masters Mr Wallace, Mr Cose etc. who were there to teach and no nonsense. I also well remember that a cane was provided but never shared. In my day, recreation consisted of just the bank holiday and two weeks in the summer – what a contrast. As regards the education then and now – well, I will not give it a voice but just think it. Home life was very regimented and, as I see things today, distinctly correct and helpful to shaping of the lives, creating and fitting us as men and women for the life to be. Parents were eminent and ruled as parents should. During my school days many great events happened. The Tay Bridge disaster, the Nile expedition, Boer War and later the African War, etc. etc. All very terrible in their way and I well remember seeing the return of some of the guards who fought in their regimentals in those days and were bespattered with blood and dust. In spite of leaving, still the war game goes on. Now I get along to the age of fourteen years, the usual time for launching out to get one’s own living. I well remember, after a domestic episode in which my father and myself were the chief factors, he giving his dictum that I must find work inside two days or go back to school and, as I preferred the former, I got going and obtained a situation in a house which I served truly and well for over five years. I can visualise the employer – my ideal of a real man – questioning me as to my own ability for work. Among the questions put was how much can you carry? So, sticking out my chest, I answered ‘Three quarters of a hundredweight, Sir,’ and from that day onward, during my junior capacity, I was well loaded each time I went delivering. I would point out that we had no trollies, trucks or tricycles, but just a tray containing goods on which I carried the weight of which often totalled a hundredweight and had to be delivered in rotation to the numerous customers. The title of the firm was Sherwood & Vesper Provision Merchants, 45 Ludgate Hill, London EC2, that was controlled by George Beach Newman and to him I owe my knowledge of the Provision Trade. My start in life was eight shillings per week for thirteen hours a day, and I recall my father’s question, ‘Where are your wages?’ I proudly placed same in front of him. He then decided that I would hand four shillings to my mother, place two shillings and sixpence in the bank and retain one shilling and sixpence for myself and buy my own clothes – what a proposition for a youth of today. One of the duties, during my first years, was to take in the last breakfast of the condemned in Newgate Prison. That came about by the fact that we served the celebrated firm of Ring Brymer, the City Caterers, and through them it became my duty to deliver such necessaries. During the five years with my first firm, many incidents occurred that have been imprinted on my mind, such men as Alderman Treelawn, Sir John Bennett and local characters like W. Straken, the Ludgate Hill Stationers, the sons of the latter were in everyday touch with me and his daughters had a smile for me. For, behold, I was by that time junior clerk and cashier and, as such, received the esteem of the above. Leading up to those years was the memory of the Phoenix Park Murders and, after the trial, the chief culprit Brady and others were executed at Newgate. Carey the informer was acquitted, receiving a free pardon and I believe a solatium from the British government and free passage to Australia. A destination he failed to reach because he was followed on board the vessel and shot by a man named O’Donnell who was brought back to England and executed at Newgate. As a small boy at that time, I remember among the crowd outside was brother of O’Donnell who, when the black flag went up, excitedly shouted, ‘My brother died bravely’ and, but for the police protection, would have been roughly handled. Ireland was a mass of trouble in those days and their next actions to voice their demand for Home Rule was the deputing of members of their secret Clan to blow up many important and Public buildings in and about London with dynamite. I well remember many members of the Clan were captured in a house in Nelson Sq, Blackfriars Rd, but, from that time and onwards, there was a reign of terrorism which put the authorities at their wits end. And, while touching on this subject, I now come to the time when I, in the capacity of junior clerk at Ludgate Hill, was the unconscious messenger and bearer of news of great portent as between the celebrated Secret Service agent Major Le Caron and the British government. The Major was the chief of the Fenian organisation on the American side and his good work between the two countries helped in a large degree to stamp out the Fenian menace. But, from the time of his leaving America for England, he went in daily fear of his life and was guarded wherever he went, and what he could not openly do, I did through my employer Mr Newman. 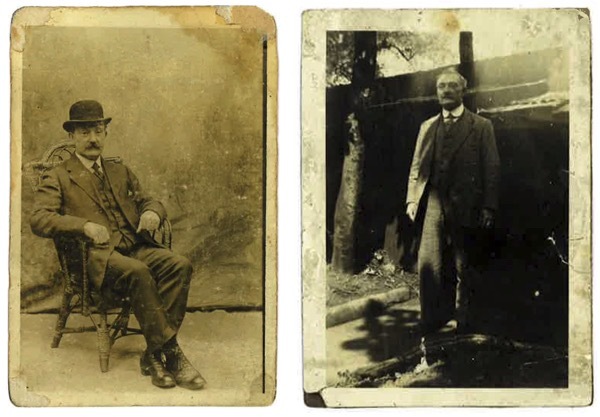 The connection of the aforesaid was – as under my employ – my employer’s name was George Beach Newman, Le Caron’s real name was William Beach and they in turn were the cousins of the celebrated Jam Manufacturers T.W.Beach. So you see, by their aid, Le Baron was able to distribute his knowledge and not forced to be his own messenger. His career as Secret Service man was very valuable and I had grown into manhood when next I saw him, by chance, seated in a carriage on his way to Hastings which also was my destination. I did hear, just a few years afterwards, of his death and, as his age was somewhere in his fifties, he died comparatively a young man. My first working years were very interesting as well as being hard-working and, as a man today beyond the sixty mark, I can think of the romance attached to my first job necessitating my calling at some of the most important buildings, firms and institutions in the City. Some are demolished or out of date but just a few remain and I can recount from memory a few of the places and firms. My old firm was on Ludgate Hill, next St Martin’s Court, which is bordered on one side by the well known City Stationers, W. Straker. While I have him in mind, I must tell you that his first start in life was sitting in a small window in the left hand corner of St Paul’s Church and printing visiting cards at so much per hundred while you wait. In his case, one can quote the old adage, ‘nothing succeeds like success.’ What a character he was, good features, curly grey hair, immaculately dressed. If he ever wore a hat, it was of the sombrero type worn at a rakish angle, with a silk coat, plush waistcoat and very pronounced black and white check trousers. In his spare time, on bright days, he would parade the pavement near or about his premises and people naturally asked, ‘Who’s that?’ He was a city character once seen could never be forgotten. At the extreme end of St Martin’s Court stood what we boys called the old London Wall – a mass about forty feet by ten and possibly the position of the ancient Lud Gate, one of the many gates protecting the City. I well remember with the tools of those days it took considerable time to demolish it. Harking back to my birthplace, the room above the factory in which I was born, stood on the old site of Blackfriars Priory and close handy was also the Church of St Anne’s Blackfriars, destroyed in the Great Fire of London but never rebuilt, where is a grand playhouse to this day and, upon that site, stood Shakespeare’s Blackfriars Theatre. All that remains today of that particular site is the Old Apothecaries Hall, where I have seen the giant spit support a whole Bullock. My early work took me to the halls of all the great City companies and I was always impressed by their stately grandeur, and many a tasty morsel has come the way of yours truly – for my work took me right into the kitchens to see his highness the Chef, who reigned supreme in all matters pertaining to food. When the factory buildings adjacent were demolished, the workers came across the old foundations of the priory and many interesting finds were made including some thousands of arm and leg bones and skulls. I think it was conjectured at the time that there were remains of old Friars or a collection of remains from the Great Fire. We now retrace to Ludgate Circus where stands the King Lud public house, very famous in its day. On the opposite side, Q.Dells the Phrenologist who placated his windows with leaflets on his knowledge of the human brain and was also another of the City’s characters. My firm found every public house of note to Temple Bar and – possibly the best house of all still remains – The Old Cheddar Cheese, in those days run by another notability, Beauford Moore. I had the honour of delivering the real Cheshire Cheese that stood on the public house bar for all and Sundry to taste. In Cornhill stood the firm of Ring & Brymer, the most noted of all City Caterers, where Turtle Soup was made from real turtles. I have seen them myself delivered by the vanload and no other firm at that time knew better how to serve up and prepare a banquet than they. When I review those days bygone – what an account – one regular order alone was forty pounds of Harris’s bladders of lard and, during the year, an order for two hundred and fifty York Hams and always ten special hams for the Lord Mayor’s Banquet. Their weekly order averaged about fifty pounds, payable every Friday morning. This would make the mouths water of tradesmen today. At that time, the Mansion House used to have its own kitchen and staff. The chef was supreme, his name sounded to us like ‘Shrubshole.’ The housekeeper on many occasions handed me some titbit with a kindly, ‘Would you like this, sonny?’ and sonny did, you bet! There is one more episode of my early days on Ludgate Hill and that was the coming to my old firm – just before Christmas time – of fine grand elderly gentlemen who were the principals of Courage’s, the Brewers which at that time was termed ‘Tomkins, Courage Cracknel & Co.’ Those five gents used to select and taste from two hundred and fifty to three hundred Stilton Cheeses to give away as Christmas presents. Each and every one of them had to be packed there and then, under their watchful eye, and labelled to Mr or Mr so-and-so. There they sat around an improvised table, tasting cheese, drinking some celebrated Courage’s Stout and munching Bath Water Biscuits. A sight for the Gods, and I doubt if it will ever occur again in the Provision Trade. These reminiscences are as good as a tonic to me. In spite of hard work and long hours, every day was of interest. Fabulous! What a story teller. I really enjoyed that, thanks gentle author. “…and I graduated to St Thomas Charterhouse, a school of sound teaching and hard and fast rules.” Obviously, they worked! How well expressed for a lad who left school at fourteen. He certainly got the basics. Really a delightful account of a working experience in bygone days. What an evocative bridge to the past, woefully as a society we remain ignorant to the horror of war. I think Henry’s memory may have been failing him slightly as Joseph Brady and four others convicted for the Phoenix Park murders were not executed at Newgate but at Kilmainham Gaol, Dublin, where their remains still lie. 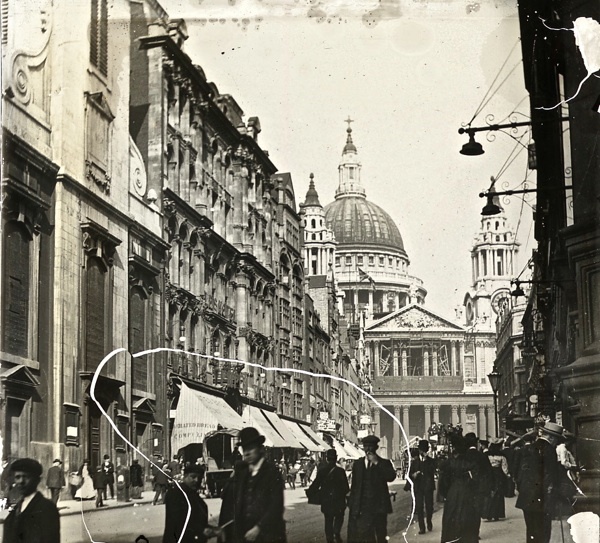 Its interesting to remember just how different the old City of London was then. It was a real City with a large population and much industry, as well as being the financial centre of the Empire. In those days trade was the powerhouse of the economy and indeed, many trades flourished in this relatively tiny area. Today all this has gone, replaced by avaricious financial services. Also interesting is his memory of the demolition of the part of London Wall that stood near Ludgate. Nothing now remains of this. Today there is almost none of the wall left in the City, the last easily accessible fragments of the Roman/Medieval wall and St. Alphege Tower that stand near the Barbican in London Wall are due to become a “feature” of the monstrous London Wall Place development now under construction. Even as recently as the 1970′s and 1980′s the City still looked as it did in the photographs shown here. 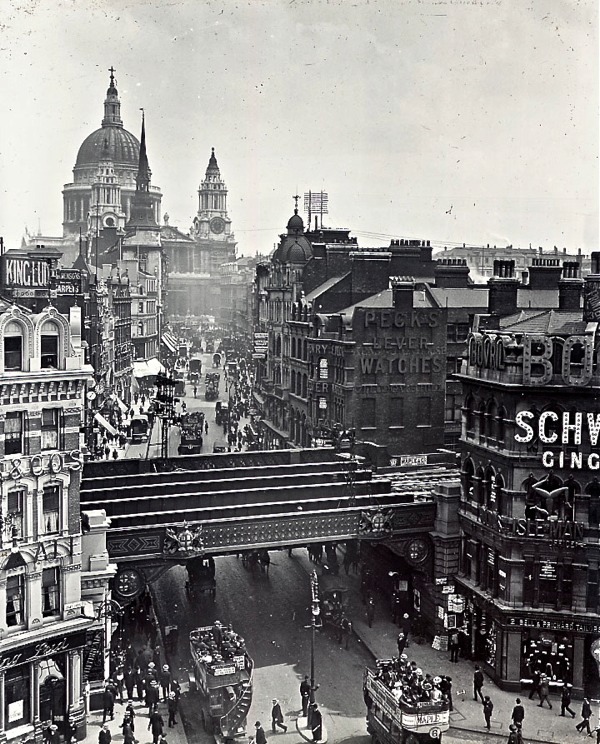 The railway bridge at Ludgate circus was demolished in 1990. When London was a real place to live & love. Now it is a Show Piece & Office Block. Fabulous descriptions, especially of catering. I could imagine no less than Mr Charles Dicken himself in attendance at such feasts I had to smile at Mr Knapp’s attitude to such outrageous developments as school holidays. I imagine he would frown at attempts to reduce the working week. What a treasure of a story. I thoroughly enjoyed that. Thank you. What a wonderful account of his work and experience. Fantastic! What a shame that at the age of 63 when my Great Grandad wrote this his memory failed him slightly regarding Joseph Brady. If only he had the internet to check his facts. However, typing up from such eloquent hand writing it may have been my mistake and I will check it. I do hope that didn’t spoil the enjoyment of his memories. Very interesting, thank you. The offices of the Pall Mall Gazette were threatened by the Fenians, and were guarded by 14 police officers plus two more on the roof. George Smith, the proprietor, carried a revolver, but he did not tell his family about it, although after his daughter gave him a hug and detected it, he had to let her into the secret. He also wore a life preserver which could be inflated by a string. My relative, Frederick Greenwood, the editor, was escorted by the police to and from his cab every time he left or arrived at the building, so these threats were taken very seriously. I think that the offices of the Times received similar threats. Thank you for publishing this – the words period piece are apt in every way. It gives us so many insights into customs and mindset of its day. This William Knapp could so easily have been “a gentle author” when we see how magnificently he tells a story. Enormous thanks to Jeanette Crawley for sharing this piece. My grandad was an errand boy in London in 1880 so now I see something of his long hard days. “These reminiscences are as good as a tonic to me.”…. oh, I love that line. Hunting down family history does exactly the same for me. What a beautifully written piece of social history; conjuring up so many tangible thoughts and images of City Life for a young man shaping his career at that time. Would love read more of life as seen through this eloquent gentleman’s eyes. WOW I just love to read about old London for someone’s eyes, don’t think I would of liked to of been around in that era though, My Mum used to have to give her wages to her Dad who sometime would give her a little bit back, I remember all my Mums stories in the 40s/ 50s living in Belfast Northern Ireland, I never got to meet my Grandfather but my Nan was a great person and I loved to hear her stories as well.